Astronaut Ed White floats in space with an earth limb behind him during his 1965 mission. In this historical photo from the U.S. space agency, Edward H. White II, pilot of the Gemini 4 spacecraft, floats in the zero gravity of space with an earth limb backdrop. 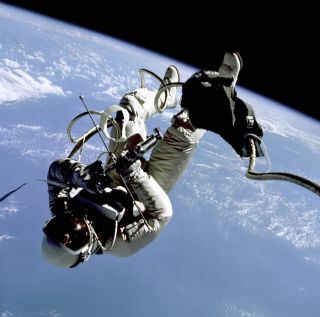 The extravehicular activity was performed during the third revolution of the Gemini 4 spacecraft and represents the first time an American has stepped outside the confines of his spacecraft.